Our day cruise from Paros , departs from the Paroikia harbour, every day at 10.00, visiting sea locations in Antiparos and Despotico. Check the sea route on the map. Our first destination is Monastiria (Monasteries), with their deep blue waters. Monastiria are two beaches, lying between two hills and appealing to the visitor with their golden sand and beautiful seabed. Our stop there lasts 45 minutes. Our guests may enjoy their first dive of the cruise. Our second stop is Despotiko island. Here we cast anchor for one hour and our visitors may : a) either visiting the archaeological site, accompanied with members of our crew ( pre- arrange while reserving) b) either sunbathing & swimming on the Despotico beach c) or stay on board, tasting traditional mezedes drinks or refreshments. Next short stop is Epitaphios (location) with the famous sea caves for a dive. Our third destination is Livadi at Despotiko. An ideal place for swimming, as Livadi is considered one of the most beautiful beaches in Cyclades. Our staff will prepare your BBQ lunch , greek deli ( mezedes ) salads, drinks and fruits. Our fourth destination, for about an hour, is the beautiful Panteronisi island ( Blue Lagoon), often referred as “the Aegean’s Carribean”. Long dives and relaxation, drinks and fruits are offered. Our day cruise ending by arriving at Paroikia port at 17.30 , while listening music and enjoying a last drink. The consumption of drinks is controlled. Price Adult 55 p.p. € & Children ( between 6-12 y.o. ) 45 €p.p. Minimum number of participants is 10 pax. Departure daily from Parikia at 08:30 and from Punta at 09:30. 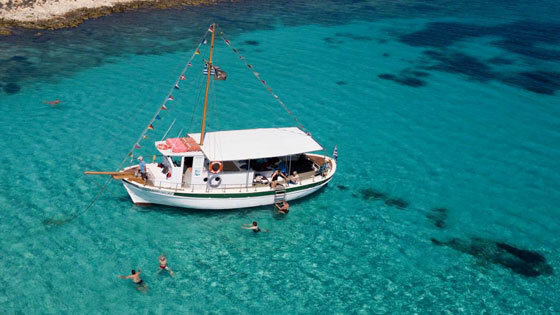 Swimming in different spots all around Antiparos, visiting sea caves and Faneromeni, some of private sandy beaches. In Despotico having BBQ & drinks. Then blue lagoon for your last dive and return at 17:00. Meal is based on local fresh products. Adult price is 50€, Children between 6-12yo price 30€. Round of Antiparos by sea, swimming, diving, snorkeling, visiting secluded beaches, sea caves, Despotico for BQQ & Blue Lagoon. Starting price 40€ or 45€ (between 21 Jun – 9 Sep), includes coffee or tea, snack & ouzo, ice cream, fruits. Kids between 6-12 yo (discount 10€), Teens 13-18 yo (discount 5€). Additional 5€ for food and another 5€ for 6 soft drinks or wine. 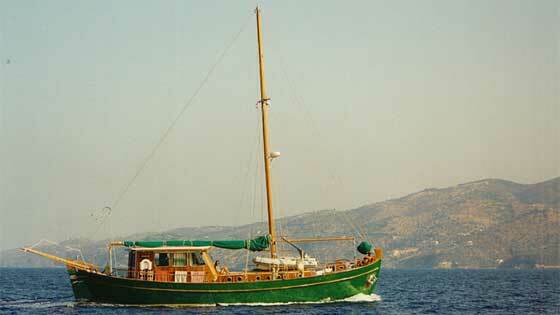 Departure from Parikia at 10:00, we will make a stop at Punta Port by 11:00 and we will return at 17:00. Our Tour includes a Visit to the turquoise waters of Panteronisia, Swimming in the Marine Caves of Mastichari and sunbathing in Despotiko. Food, fruit and refreshments or wine accompany you throughout the journey. BBQ on board, fresh organic vegetables from local farms will be served for lunch. Price 55 € for adults and 45 € for children 6-12 years .